We present special Chuckles with pure and delicious taste which is bound to bring a chuckle. Our Chuckles was launched in the early 90's. â��Chucklesâ�� comes in two yummy flavors of Chocolate and Strawberry. Chuckles blue is the only chocolate with the goodness of milk chocolate. Chuckles pink, on the other hand, has the ability to scintillate the senses with its unique taste. The creamy feel of a chocolate and the divine taste of strawberry make these Chuckles special. 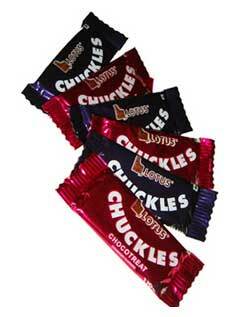 Chuckles chocolates offered by us are a hit with the kids and adults alike.